A hernia is a rupture of a bodily organ or structure. A bulge or protrusion develops and pushes through the wall cavity. In the human body the hiatus is located between the esophagus and the stomach. It is an opening in the diaphragm. When a hiatal hernia occurs the stomach bulges through the chest via the diaphragm opening. This form of hernia does not offer clear cut symptoms in many occasions. In some cases chest pains can be associated with the condition. Testing is the way a diagnosis can be verified. A specialized X-ray is a common method of detecting the condition. Surgery is needed for a hiatal hernia when there is a risk of the blood supply being cut off due to a constriction, or if the hernia may become strangulated. 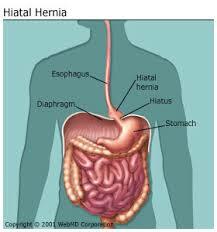 The following procedures are involved in performing successful hiatal hernia surgery. * Two incisions are made on either side of the the hernia. * Through the stomach the surgeon has to locate the defect in the diaphragm. * The incisions being closed ends the process.